"It says by early May, the 13-year cicadas will emerge from hibernation much earlier than their "dog-day" cicada counterparts that typically arrive in late summer. The department says the periodical cicadas spend 13 years in the ground feeding on sap from tree roots before emerging en masse. 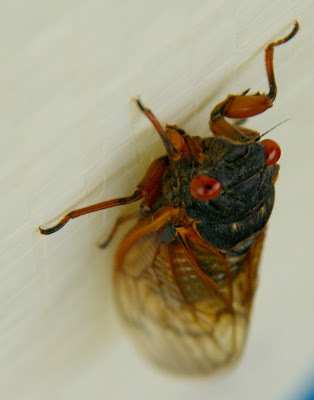 The 13-year cicada is much smaller, but noticeably louder. They'll gather in trees over a single acre chanting their mating calls. They have dark bodies and reddish eyes." Hmmm, that sounds pretty cool. 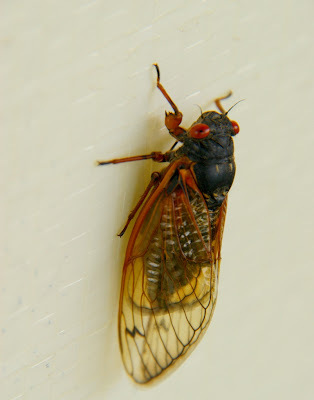 "The last time the Show-Me State saw the 13-year cicadas was in 1998 -- a particularly large brood. This go-round, they're expected to cover most of the state. The department says the Bootheel and parts of northwest Missouri will escape them. The noise will likely be gone by June." "and I don't care, so there"! That's tellin' 'em, Misty. If you think they're cute, well, you go right ahead and think it. I have my critters all shot and ready to post tomorrow. This list help me very much to get information about many things.I am not the only one having all of the enjoyment here! maintain up the great work. Whoa, what a big ugly bug. Great closeups, Misty! Wow, if a 13 year nap does that to one's eyes I don't think I'll try it :). Nice shots. he may be ugly, but i like the songs they sing! Happy Critter Day! Fantastic detail! The colours are great and as for those eyes wow! Good job you got the photos when you did it could be a long wait for the next photo shoot. Love the photos, as I always do. But the info about them was absolutely incredible!!! Never, EVER knew all this. My Critter blog this week is a photo of a laughing gull, AND I added a touching dog video -1.5 minutes long- of a dog that was blown away in a tornado only to CRAWL home 2 weeks later. It's a must see...the stamina and determination of animals. Here's my link to Camera Critters. He is beautiful. I'm fascinated by those long lifecycles, especially since many species who have adopted it have a prime number cycle - that keeps them from coinciding with the cycles of other species. Very cool. Hummm...ya think he's hungover from a night on the town, what with those red eyes and all? Nice shots Misty, and nice of him to stick around for a photo session. Informative post and great close ups. Boom & gary of the Vermilon River, Canada. It's amazing to me that they live so long, almost in suspended animation like that under the ground. I agree with you, those red eyes are striking! I can't help it...they're pretty gross.